Well ok, this may not be the ultimate punchlist, but I thought it was worth sharing. 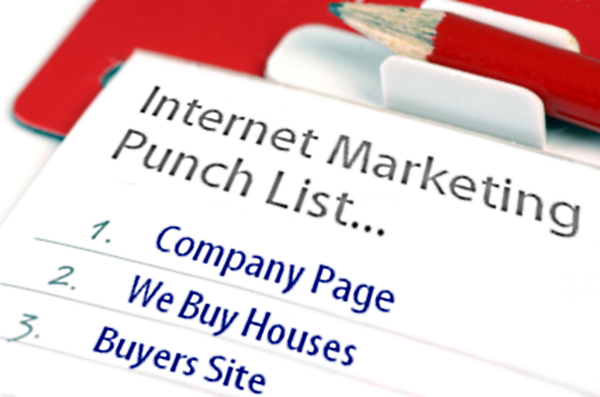 As I mentioned in my previous post about being over whelmed when it comes to Internet Marketing For Real Estate Investors, I wanted to build a punch list. This punch list is going to be my guide to what has to be done in order to be successful. There are potentially an unlimited number of websites that you can create for your business, but I’ve decided that THREE would be the ideal amount. You first need a company site in order to give you a more professional appearance. Your leads are going to search google for your name and a nice professional site gives them confidence in you. It is also then a good idea to separate out your buyer and seller pages I feel. The reason for this is that you’ll be able to better drive traffic to those pages by focusing your message to the specific target. Scott, I just came across this post and wanted to give you kudos for doing such a great job in breaking down what needs to be done for RE investors. A question I have for you is how do you go about finding a free guide/report and how difficult is it to add to your website or squeeze page for a non techy investor? That is a good question and a question that I’ve had over the past few years. You basically have to create it yourself or buy the rights from someone to use theirs. The website package that I got from InvestorCarrot included the free reports so it made my life easier because I was not looking forward to having to write that stuff. Once you have the free report, you can use a service like Aweber to have people sign up and then deliver them the free report or I’m sure there is a wordpress plug-in that will do something similar for free. The idea is that you have an Opt-in form they fill out with their name and email address and then after that they get forwarded to the download page. Sorry for not be very specific, but the process varies depending on what your motives are. quick question about the investor carrot website package, does it use a Windows or Linux platform (PHP files) and are website products easy to plug in/use? The reason I ask is I’m currently with another vendor (using a squeeze package) and it’s a nightmare!! My hosting site attempted to help me out, to upload templates to domains and 1:45 minutes later (kudos to my service rep) we were no further than when we started. I’m looking for something that is quick to upload as well as edit. Investor carrot is what I like to call a closed hosting package. You don’t have access to the backend servers like you would with say hostgator or blue host. It is a WordPress setup however, that is customized. They handle all the setup of your pages and all the initial content. Just like any WordPress website you have access to the admin area where you can add, update and remove content as well as make changes to page formatting and such. They have a special where you pay only a $1 for a month of the pro package. It’s worth it to give it a shot and see what it’s all about. Do you have any other specific questions I could answer? I’ve been looking at oncarrot.com and wanting to know what the diferences are between the 3 websites from oncarrot vs wordpress? Also are the 3 websites different domains or are they subdomains? By default the three websites are setup to be your main Company website, Seller Leads Website and a Buyer Leads Website. They all will have their own domain name. Mine are.. These are the default setups for these sites. I imagine you can gear them towards what ever you like though. The company website is where I’m putting everything about what my company does. It’s a mix of things that might interest a buyer or a seller. Sort of the entire enchilada. The Seller and Buyer sites will be geared strictly towards my target. I will have squeeze pages, free reports and distinct content that is setup to target keywords that would attract the type of lead I want. Oncarrot uses wordpress as their platform so there are only a few differences. It is a bit less flexible however (probably a good thing). Like you can’t add your own plugins. Outside of that it’s basically the same. I’m going to be holding a contest to give a huge discount away (70% off for life) on the 3 website package today or tomorrow.